Another self released cassette of Giancarlo Toniutti's student electro-acoustic compositions that fit nicely in the more cerebral end of the Italian Industrial spectrum. 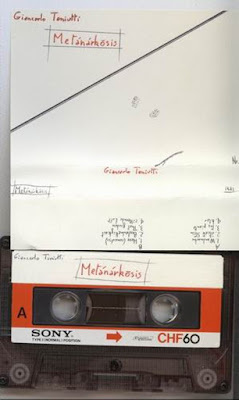 These minimal electronic field recordings,with the occasional submerged speech in German (probably by some unnamed Nazi? ),and found object percussion,carry that signature feel of 'Control' that wannabe 'serious composers' force on the sound. Personally, I prefer a bit of chaos theory to invade my non-music.It becomes a bit predictable after thirty seconds of each track. Nobody's perfect, especially if you try to be. DOWNLOAD some un-chaos theory HERE!